Norman Rockwell meets 2012. Don't worry, this picture is staged. 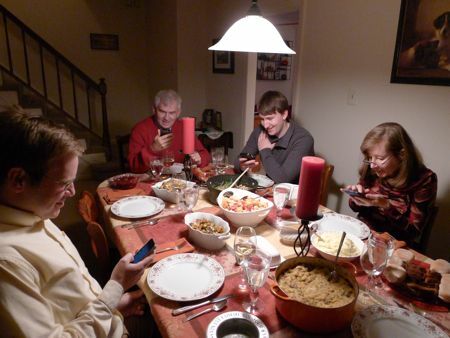 We did talk to each other, instead of staring at our respective smartphones at the dinner table. When you see your parents semi-successfully navigating Android phones, doesn't it make you feel like we are truly in a brave new world? As for the dinner itself, my brother smoked the turkey outside on the grill, while my mom labored over the sides. In accordance with tradition, I made a mess hall's worth of mashed potatoes. Mostly for myself. It's my favorite food after all. Other than that, I didn't do too much work. I showed Joe my room at my parents' house, untouched since my teen years. Which means the creepy White Stripes poster is still on the wall and there are stuffed animals everywhere. "Look, I'll show you all the stuffed animals I treasured as a child," I said to Joe, gesturing at an entire bookcase of teddy bears and Beanie Babies. "Please no," he said, with true fear in his eyes. Then he relented. "Maybe just the most important one or two." "Well, they all have a long and complicated backstory," I said. 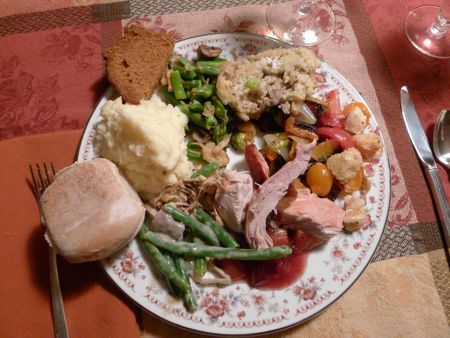 Hope everyone had a delicious dinner and a restful holiday weekend! 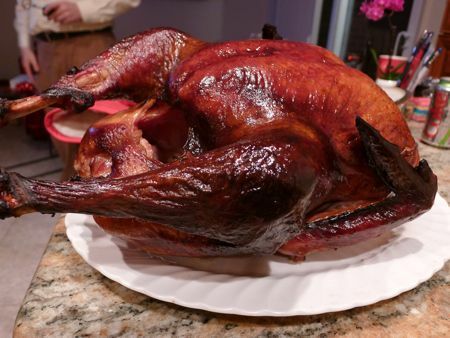 And I hope your turkey was as gorgeous as this bird! November 25, 2012 by Adele Chapin.